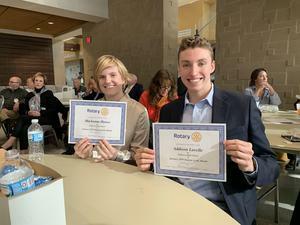 Rotary Student(s) of the Month! The local Rotary club honors area students each month. For the month of January the students are: Mackenna Hawes and Addison Lavelle. SHOW CHOIR WINTER WARM UP!! Merry Christmas from Anderson High School! Our band department spreading some holiday cheer! Christmas break will start December 22nd through January 6th. Stay safe and warm during this season! Anderson High School & Madison Park Chuch working together this season! Anderson High School and Madison Park Church are partnering to do a FREE food giveaway this Thursday, December 20th. Distribution will begin at 5:30pm from the South entrance of AHS. We will be giving away a few hundred boxes that contain two weeks worth of breakfast and lunch items, as well as snacks. Boxes will be given out on a first come first serve basis. Only one box per AHS family will be permitted. 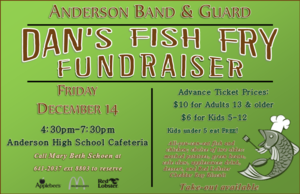 The Anderson High School band and guard are sponsoring Dan's Fish Fry on Friday, December 14th from 4:30pm to 7:30pm. Kids under 5 eat free! All you can eat fish and chicken, choice of two sides: mashed potatoes, green beans, cole slaw, applesauce; drink, dessert and Red Lobster Cheddar Bay Biscuit. Please call Mary Beth Schoen at 765-641-2037, extension 8803 to reserve. Our Veteran's Day program was a successful convocation with many Veterans in attendance. Our very own Captain May was an outstanding speaker. Our NJROTC cadets also presented the colors at other Veteran Day events. AHS would like to thank all Veterans for their service. About 34,000 commended students throughout the nation are being recognized for their exceptional academic promise, placing among the top five percent of students who took the PSAT. 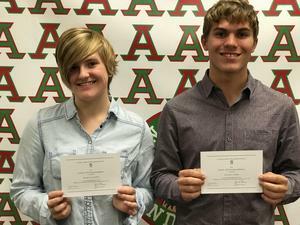 We congratulate Mackenna and William for achieving this distinguished honor. Anderson High School continues to strive for excellence in all that we do. Our Lady of Mt. Carmel's Merciful H.E.L.P. Center is participating with St. Ambrose & St. Mary's Church and Holy Cross Schools to provide a " Community Care Day" that assists Anderson families with new shoes, socks, underwear, book-bags, coats, hats, gloves, shirts and sweatshirts to finish the school year. Children and parents will be able to choose the color, size, and style of some items! The program will take place January 12, 2019. Walk-ins will NOT be able to be served. Please complete the attached registration and mail it NO LATER THAN November 12, 2018. Anderson High School is proud to honor our Veterans during a program on Monday, November 12th at 8:30 am. The program will take place in the high school gymnasium. All Veterans and their families are invited to join us beginning at 7:45am in the high school cafeteria for a reception before the program starts. Please leave your name, branch of service and number of guests when you respond. We are looking forward to honoring our Veterans and their families. We are proud to honor the students from Anderson High School that obtained a GPA of 3.7 or higher during the 2017-2018 school year. Students were notified by a letter of invitation. The program will take place on Tuesday, October 30th at 7pm.